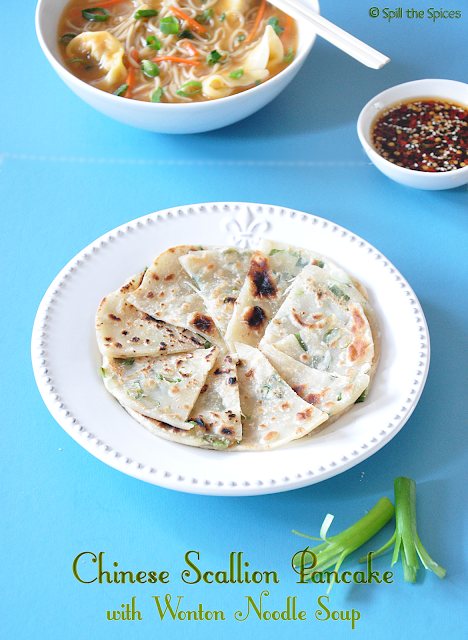 A scallion pancake or cong you bing is a savory Chinese flatbread. Unlike the normal pancakes made with batter, this is made from dough. The dough is rolled and folded with oil, scallions and seasonings. It is then coiled, rolled again and pan-fried on a skillet resulting in flaky pancakes. I made these pancakes along with the Cantonese Wonton Noodle Soup for the IFC Challenge. These flaky pancakes tasted quite similar to our Indian parathas. 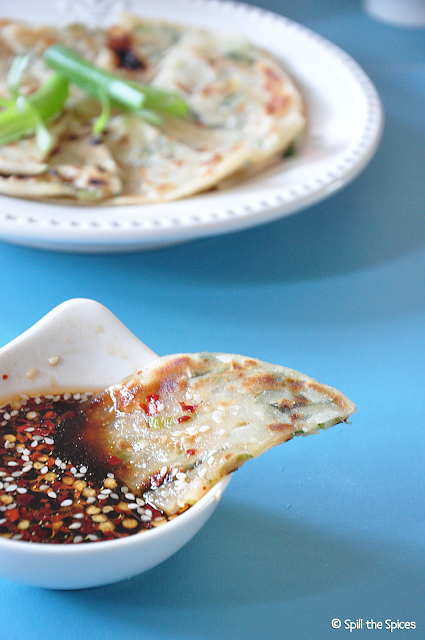 You can serve these pancakes with chilli sauce or soy sauce or ginger dipping sauce. I served these pancakes with a soy dipping sauce. You actually don't need any accompaniments for this pancake as they tasted delicious by itself. Just serve them hot! 1. Combine the flour, salt and oil in a large mixing bowl. Bring the water to boil and pour it on to the flour. 2. Mix in quickly with a wooden spoon to make a dough. Transfer it to a floured surface and knead into smooth and soft dough. Cover and let the dough rest for 30 minutes. 3. In a bowl combine scallions, salt and pepper. Set aside. 4. Divide the dough into equal pieces and roll them into balls. Place a ball of dough on a well-floured work surface and roll out into a thin circle. 5. Brush the surface of pancake with sesame oil and sprinkle a tablespoon of the scallion mixture. 6. Roll the dough up from one end to the other. Then then curl the roll around in a spiral and pinch the end to the roll so it stays wrapped. Flatten the roll with you palm and roll the pancake to 1/8th inch thickness. 7. Heat a frying pan or skillet over medium-high heat and pour little oil. When oil is hot, place the pancake and cook until golden brown on both sides. 8. For the dipping sauce, mix all the ingredients in a bowl. Cut the pancake into wedges and serve with the dipping sauce. Sona, this is delicious and a good looking post. everything looks too good. This looks so yum... love dat pancake dipped in the soy!!! So delicious and beautiful dish..
Lovely presentation, i enjoyed thoroughly those scallion pancakes and loved it with my bowl of soup. Love the paratha like pancakes I want some of that wonton soup u made earlier:). looks super tempting..lovely presentation sona..love the 2nd clicks..
Love the way you have arranged the pancakes.. Very tempting.. Stunning clicks..
OMG! 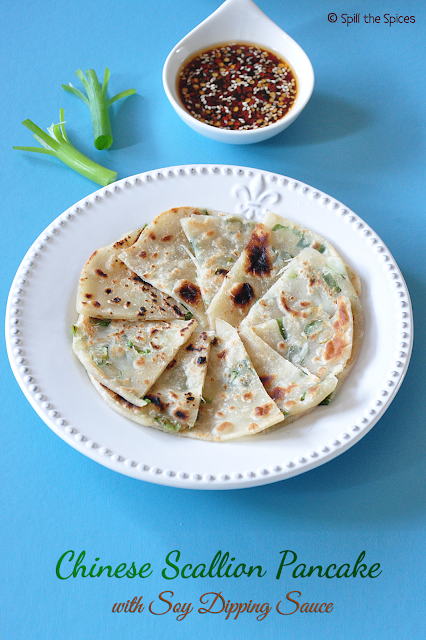 scallion pancakes are yummy and looks very perfect. Loved your presentation dear. lovely clicks! pancakes looks delicious and inviting. Loved all your pics, just beautiful! Delicious pancakes, looks yummy.